The pressure of being the overall number one seed in their bracket didn't phase Soaking at Second one bit. Playing their first playoff game in the semifinals against a Back Up Off Me, Pitches! team that was riding a lot of momentum from their quarterfinal upset, Soaking at Second knew they had to be ready to play. A strong offensive start in the first few innings coupled with unyielding fielding gave them a lead that they would refuse to surrender. 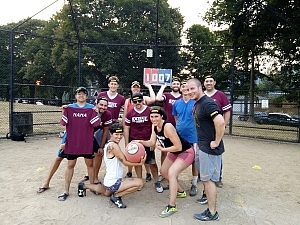 After locking up that first victory, Soaking at Second found themselves matched up with the Below Average Athletes for the opportunity to be named Irving Park Champs. Fresh from a win themselves, the Below Average Athletes were just as ready as Soaking at Second. Like all the best championship games, this game was back and forth the whole time with neither team building a comfortable lead that they could count on. The game would come down to the final two innings with a one run lead for Soaking at Second. As they had done all day, Soaking at Second kept relying on their defense when it mattered most. They held the Below Average Athletes at the top of the 6th and tacked on a couple runs to stretch their lead to 3 runs entering the 7th. Needing just 3 outs to seal the game, Soaking at Second was in total control of their own destiny and they were not about to let the win slip away from them. They kept their focus, played it smart, and got those 3 crucial outs needed to seal the win and become our champs.